Every time you volunteer to work alongside Future Homeowners, Partner Families, and your neighbors, you make a difference and you change lives (yours included). Everyone can do something to help make sure every child, every family, every grandparent has a decent place to live. Every Hand. Every Hour. Every Voice. Volunteer opportunities exist in our offices, on our project work sites, and at ReStore. We are always seeking passionate, caring and knowledgeable people from our community. No experience is necessary – but those will construction skills or licensing are especially needed, even if for just one project. 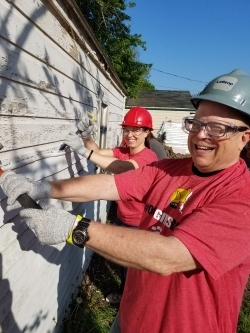 Habitat worksites (Home Repair Ministry and Homeownership) are designed for those with no experience to learn and contribute. But we always need skilled volunteers to help us get each day's work done! Hands on construction and safety training is offered each day by our staff and skilled volunteers. Your donation of even one day or project of services will allow us to serve more of our neighbors. Our regular construction staff and volunteers are skilled in many areas, but none are licensed and we must pay for many services. Scheduling is flexible and can be based on your availability. Contact us to learn more about how your skills, for even one day, can make a huge difference. Working together at a Habitat site provides team building and a sense of accomplishment. Larger group days can be scheduled not only on build sites but at ReStore, on an exterior painting project or for community clean-up. If your business, work group or community organization would like more information, please contact us. Learn more about how to volunteer at ReStore. Court Ordered Community Service Volunteers: Please read here about how to set up your hours to complete community service hours. No matter what your age, you can make a difference. If you are under 18 years of age, visit our Youth Volunteers page to explore the ways to get involved. Homeowner Selection & Support, Development, Repair Program, Finance. And more! We have standing committees and special task forces that help us accomplish our mission and move us into the future. Committees meet before or after regular work hours and provide a way to make a difference without swinging a hammer! Contact us to find out more. Some of our most faithful volunteers you may never see. They work in our offices on the administrative and data tracking efforts that provide a strong framework for our ministry. Can you work with databases, excel sheets, a filing cabinet, or design software? You can make a difference from behind the scenes. Contact us to find out more. Construction and retail settings can be dangerous business. And that is why safety is our #1 priority every day, on every job site, with every person. We want all of our volunteers to be safe on site and to feel comfortable doing their work for that day. We don’t assume our volunteers know all the safety rules and we train each volunteer for each day’s work. And we encourage our volunteers to ask for help if they have a safety concern.